Sarath Fonseka and Gotabhaya Rajapaksa were selected as defendants in lieu of SL President Rajapaksa because Gotabhaya is a U.S. citizen and Fonseka, a permanent resident alien, for whom the United States is responsible as moral, political, and legal matter, Bruce Fein explains. TamilNet: Can you describe the legal process your group has chosen to bring Sarath Fonseka and Gotabhaya Rajapaksa to justice in U.S. courts? 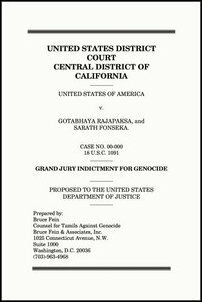 Fein: The United States Genocide Accountability Act of 2007 (GAA) makes Fonseka and Gotabhaya Rajapaksa subject to a genocide prosecution in United States courts even though the genocidal acts against Tamils occurred in Sri Lanka. The United States may constitutionally assert extra-territorial jurisdiction over a certain category of universally condemned crimes, which include genocide and torture. The United States recently brought a torture prosecution against the son of Liberia’s Charles Taylor for torture perpetrated in Liberia. They are criminally culpable under the doctrine of command responsibility for criminal acts of their subordinates which they should have known about and prevented or neglected to punish after-the-fact. TAG [Tamils Against Genocide] has virtually completed a model federal grand jury indictment of Fonseka and Rajapaksa charging violations of the GAA. The facts demonstrating genocide have been compiled from TAG’s independent research and investigations. The two were selected as defendants in lieu of President Mahinda Rajapaksa because Gotabhaya Rajapakse is a U.S. citizen and Sarath Fonseka is a permanent resident alien for whom the United States is responsible as moral, political, and legal matter. The model indictment will be presented to the new United States Attorney General appointed by President Obama and the new Secretary of State. The two appointees hold the keys to a genocide prosecution, which only the government can initiate. TamilNet: Do U.S. courts have jurisdiction over acts violating international law or U.S. domestic law in Sri Lanka's sovereign territory? Fein: The model indictment describes the culture of genocide in Sri Lanka built on the doctrine of Sinhalese Buddhist supremacy celebrated in the Mahavamsa, the teachings of Dharmapala, and the exhortations of contemporary Buddhist monks. The indictment then collects three categories of genocidal acts intended to destroy Tamil groups in whole or in part in various villages or municipalities in the northeast based on ethnicity or religion: extra-judicial killings, including disappearances; serious bodily injury; and, creating conditions of life intended to cause the physical destruction of Tamil groups, for example, starvation, malnutrition, impaired medical care or medicines, never-ending physical, economic, or physical insecurity, massive and repeated internal displacements, or Sinhalese Buddhist colonization. The genocidal acts TAG has chronicled in the draft indictment surpasses by far the genocidal evidence in the charges against former Bosnian leader Radovan Karadzic. TamilNet: In the U.S., criminal indictments can only be initiated by the Department of Justice. What is TAG's next step to convince the Justice Department to begin a grand jury investigation? Fein: TAG will seek to enlist the support of Members of the House and Senate to champion the genocide indictment with the Attorney General and Secretary of State through letters, confirmation hearings, and otherwise. TAG will also seek congressional hearings on the ongoing Sri Lankan genocide. It will also publish articles and meet with editorial boards of newspapers to rally public United States support for the genocide indictments. TamilNet: Is the international climate conducive for your legal action, and do you think Obama administration with Eric Holder as the new attorney general will be inclined to support this effort? Fein: The genocide of Sri Lanka’s Tamils has now become mainstream thinking in Tamil Nadu, Malaysia, South Africa, and elsewhere. It explains in part Sri Lanka’s eviction from the United Nations Human Rights Council. Amnesty International and Human Rights Watch have also been vocal detractors of Sri Lanka’s human rights atrocities. Further, this week New York-based Genocide Prevention Project has included Sri Lanka as one of the eight "red alert" countries where genocide and other mass atrocities are underway or risk breaking out. Also, the Obama administration was handed a policy report on genocide with specific recommendations from former Secretary of State Madeleine Albright. This is likely to bring Sri Lanka’s genocide into U.S. focus. TamilNet: Besides the U.S.Group, who else is supporting your legal action? Fein: TAG has received support from U.K. expatriates, and Australia. We welcome the support of other individuals or organizations. But TAG will not waver from its exclusive feasible goal of genocide indictments and prosecutions of Fonseka and Rajapaksa in the United States undistracted by a United Nations organized plebiscite on Tamil independence, or a prosecution before the International Criminal Court. TAG has one goal and one goal only. TamilNet: Are you pursuing any other legal avenues, and if so, can you elaborate? Fein: The Torture Victims Protection Act (TVPA) authorizes any person or their legal representatives to bring a civil suit for damages against any other person complicity in their extra-judicial killing or torture under color of foreign law wherever the wrongdoing occurs. The advantage of a civil suit is that the initiative does not require the approval or support of the U.S. government. Once adequate funding for the litigation is secure, the contemplated TVPA suits would involve representatives of the murdered Trinco five students and of the seventeen murdered Action Against Hunger workers. Damages could exceed $50 million. As with the GAA, the TPVA applies extra-territorially to wrongdoing perpetrated in Sri Lanka by Sri Lankans against Sri Lankans.